Across the U.S., there are 63 active, Native American-led grantmaking programs that are making major contributions to the social and economic well-being of their local communities, regions and the nation as a whole. These efforts are aimed at improving education, health, economic development and cultural preservation. 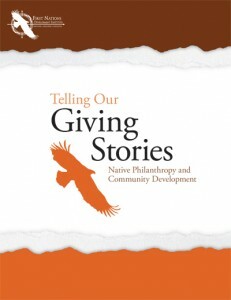 A recently-published report tells some of the stories behind these Native-driven philanthropic endeavors that show the substantial and lasting impact of tribal philanthropy. Titled “Telling Our Giving Stories: Native Philanthropy and Community Development” and published by First Nations Development Institute (First Nations), a highlight of the report is a case study of Oregon’s community-based Native foundations. The Oregon case shows that by working collectively and collaboratively, tribal giving programs can multiply their outcomes beyond their individual grantmaking contributions and leverage their investments into greater influence, resources and impact. For example, since 2001, these tribal foundations have given more than $100 million in grants, positively impacting the local community, state and beyond. Tribal governments are very active in formal philanthropy. 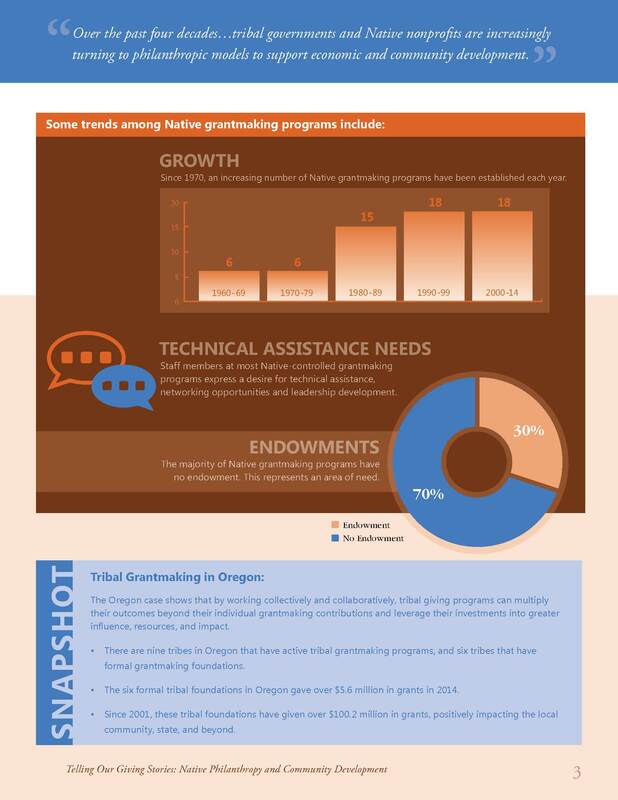 Of the 63 active Native grantmaking programs in the nation, a majority (41) are tribally-affiliated. 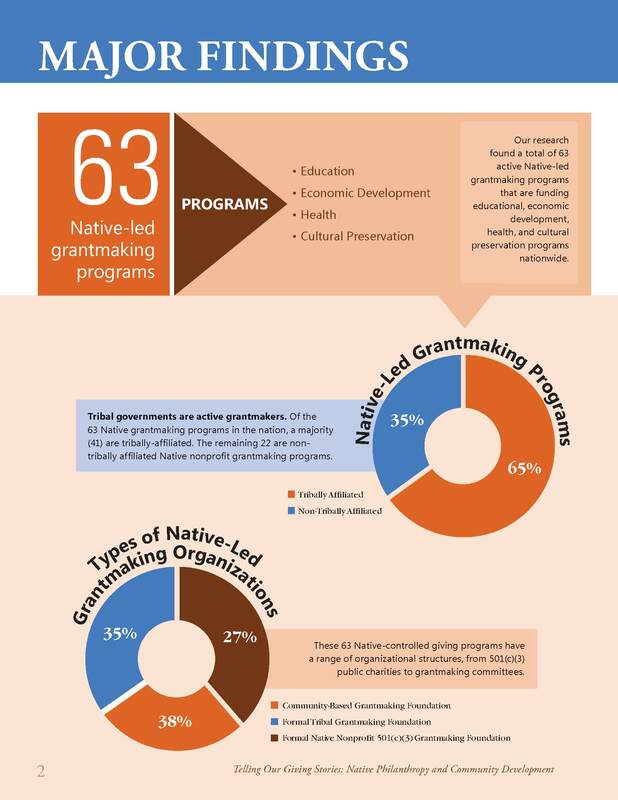 The remaining 22 are non-tribally affiliated Native nonprofit grantmaking programs. The majority of Native grantmaking programs have no endowment, which represents a significant area of need. The report documents that a large and growing number of tribes and Native nonprofit organizations are using philanthropy to protect Native financial assets, capitalize economic development programs in their communities, and support their cultures. 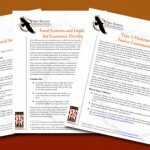 Oregon’s six community-based Native foundations, in particular, represent a potential model of Native philanthropy at a state level that may help tribes leverage their giving programs into statewide philanthropic and political influence, among other things, including an opportunity to educate non-Indians on their histories, cultures, values, assets and aspirations. 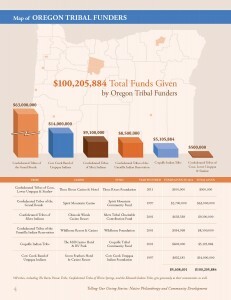 The six formal tribal foundations in Oregon gave more than $5.6 million in grants in 2014. Staff members at most Native-controlled grantmaking programs interviewed for the report expressed a need and a desire for increased technical assistance, networking opportunities and leadership development in order to boost their organizations’ capacities. Several Oregon tribal foundations are moving toward giving programs aimed at other tribes and to national Native American organizations, which represents an interesting development in tribal giving.